in front of the shop in a very long time. I wouldn't say I got complacent just no time with everything else that was going on around here. This year I decided to go a little over the top and WOW the socks off my guests as they arrived. A while back I did a lot of clean up outside the shop area. I originally shared that post HERE. It's always fun to go back to see how far you've come, and this area as come along way. A friend of mine has a farm East of here, they raise corn, cattle have a few goats along with a few other things. 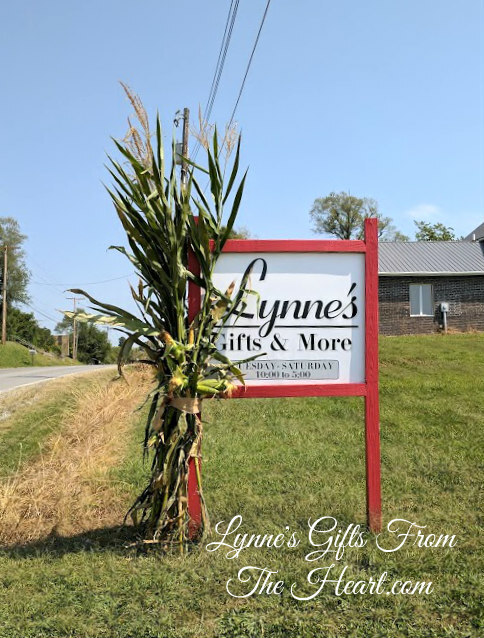 I contacted her to see if they had any corn stalks. Her son brought a truck load in along with a couple of bales of straw. I thank God above everyday for this friend and all she does for me. I had a ball putting together the stalks. They were tall, heavy and quite bulky after a fashion I got them together and tied around the posts. Burlap ribbon was used to tie around the area to cover up the baling twine I used to hold the stalks together. My original plan was for a big bow, along the way plans changed I decided to go a little more simple. They were incredibly tall, reaching above the portico. Can you imagine what they looked like in the fields swaying to the sounds of the winds? As you pull in you'll see this small area. Underneath the vines there's a rooster metal arbor, been there for years. I almost pulled it out this year, sure glad I didn't. It's the perfect thing to tie the sweet corn stalks to. Sweet corn stalks are quite a bit shorter than corn stalks, this area was perfect to display them. A weathered milk can is the perfect vessel to hold one of the mums. The addition of a bale of straw a few more mums and most definitely a pumpkin finishes off this area. Back underneath the portico I moved the chimenea to make the area with the black bench a little more cozy. It's a great area for friends to gather and visit the afternoon away. Putting the umbrella away freed up the area to decorate the top of table. I gathered a few white pumpkins gourds and placed them in the cast iron urn. I wrapped a bit of the twiggy vine from the shop around them to give it a bit more texture. The ferns are going strong and look beautiful. I always miss when it's time for them to be put away for another season. A couple of pillows warms the bench waiting for you to join them. Even the entrance at the end of the lane got a bit of decorating. So, when you come to my area look for the decorated sign at the end of the lane, it welcomes you as I do with love and a smile. I'm dreaming of something big for the Holiday Open House, any ideas? The shop will be open 20 years this year I'm needing something big and happy. Thanks for stopping in to see the shop entrance decorated for fall. I hope you have the most beautiful day ever. Our weather is insane, I can't do anything I want to do outdoors. Next week will be better and more like fall. You've been doing good...I love your photos. Jumping right in! I love everything! I'm looking forward to starting next week. I feel just awful that I’m so close yet haven’t made the trip there to visit you and see your shop! I’m debating whether it’s best to come for the autumn 🍂 decor or winter. Maybe since you went through all the trouble of all this fabulous decorating for fall, I should do both! I’ve got an awful lot going on over the next 2 weeks, but perhaps after that...it would make a nice day trip for me! Seems like my husband and I ate at a really good “greasy spoon” restaurant right off the highway in Richmond once. Wonder if it’s still there? Only one way to find out! I’m coming soon! Oh how I wish I could come visit you, sit on the portico with you and just chat! What a wonderful space! How sweet of your friend to give you the corn stalks and hay bales! I love everything you have done with this area; it is so lovely and inviting!! !